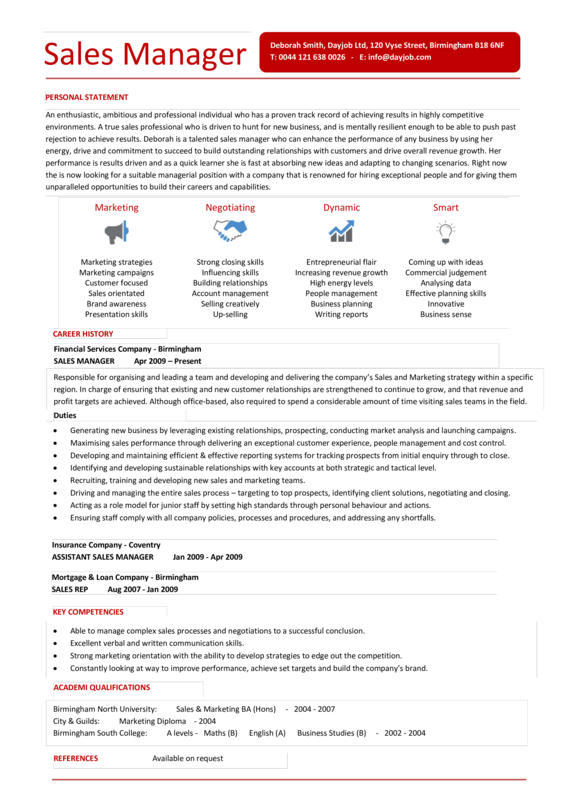 This Sales Manager Resume template will certainly grab your future employer its' attention. After downloading, you have a good sample resume to start making your own personalized one. Developing your own personal Sales Manager Resume has never been easier, and will be finished within in minutes... Download it now! Marketing Negotiating Dynamic Smart Marketing strategies Marketing campaigns Customer focused Sales orientated Brand awareness Presentation skills Strong closing skills Influencing skills Building relationships Account management Selling creatively Up-selling Entrepreneurial flair Increasing revenue growth High energy levels People management Business planning Writing reports Coming up with ideas Commercial judgement Analysing data Effective planning skills Innovative Business sense CAREER HISTORY Financial Services Company - Birmingham SALES MANAGER Apr Responsible for organising and leading a team and developing and delivering the company’s Sales and Marketing strategy within a specific region..